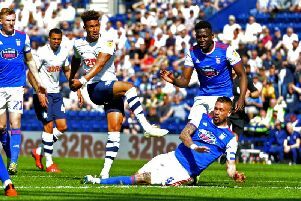 Preston North End’s fine start to 2019 continued with a derby win at Bolton Wanderers. Alan Browne and Tom Barkhuizen got the goals as the Lilywhites dominated before Clayton Donaldson pulled one back late on. Below we take a look at the main talking points. This derby victory was a third in a row at Bolton and a third straight win on the road in the league for the first time since 2015. Alex Neil has been bullish about the play-offs and his side making a late run at the top six. This was another performance where you left thinking ‘why not?’. PNE controlled this game from start to finish with goals in each half extending their unbeaten run to five games. The only criticism that could be levelled at North End was that they didn’t make sure of the points sooner, Tom Barkhuizen scored seven minutes from time to seemingly settle any nerves only for Clayton Donaldson to pull a goal back late on. That aside, things are certainly looking up. Alex Neil keeps telling us his man is the best in the division in his position and on this evidence you simply cannot argue with him. With PNE allowed to have the ball his swagger was evident at the base of the midfield. He also of course broke up play in his customary manner and then drove forwards when chances arose. Whisper it quietly but one of the standout things from Pearson in this game was the sight of him pulling out of a challenge he was simply never going to win in the second half. He’s regularly gone the other way as we saw at Sheffield Wednesday and against Derby, the latter only punished by a yellow card. All in all, not only is Pearson the best player at Neil’s disposal, but he might just be getting better. This was an afternoon where PNE were made to do something that isn’t necessarily a forte of theirs. Bolton were happy to sit in and let the visitors have the ball and make North End work to find a way through. It took time but after Tom Barkhuizen had missed one excellent chance, the visitors cracked the code late in the first half. They moved the ball around really nicely, Barkhuizen key, before Alan Browne drilled home a low shot. The Lilywhites are more used to exploiting sides in open games and this was a different test for Alex Neil’s side and one they passed, helped by the manager’s decision to employ Sean Maguire in a more fluid frontline. Tom Barkhuizen replacing Jayden Stockley was the only switch from Alex Neil who made a change to his side for the first time in four games. That meant that having been out on the left Sean Maguire moved through the middle. An encouraging return from injury since the turn of the year has only been lacking a goal. The Irishman came within a whisker of that shortly after PNE had opened the scoring. It was vintage Maguire as he danced past two men before only being denied a goal by the outstretched leg of Wanderers ‘keeper Remi Matthews. As ever though with a man described by Neil as his ‘talisman’, Maguire’s forward play was excellent, a player of his stature impressively occupying a physical backline before supplying the second goal for Tom Barkhuizen. It really was a fine sight in the away end on Saturday, more than 4,500 PNE fans having made the trip to the University of Bolton Stadium. Problems off and on the field at Bolton meant that it was never going to a raucous atmosphere from the home fans and that understandably proved to the case. The visitors on the other hand certainly enjoyed themselves once again, a short trip down the M61 becoming a must for any North End fan after the wins in 2016 and 2018. They have been a credit to their club in recent weeks with Neil’s men well backed at QPR and Stoke and here again those supporters were rewarded.